ready to shout the name of Blake Snell toward the sky and proclaim him to be your Cy Young winner for the season? Snell spun his magic again Sunday afternoon, winning his 21st game of the season (a Rays' record) in a 5-2 victory over Toronto. Snell went 6 2/3 innings in the game, allowing no runs and three hits despite leaving his fastball in his back pocket. Snell, who has one start left in his season, leads the league's starters in ERA with a 1.90 mark. He struck out 11 more batters, bringing his total to 211 on the year. the dugout for the last seven outs of the game. He's shy of the 200-inning plateau, which might cause others to vote elsewhere. Then there are the humble beginnings to his career. Snell never won more than six games before this year. (Granted, it's a one-season award). So who beats him? Anyone? How about Blake Treinen? The Oakland closer is the most recent leader in ESPN's Cy Young predictor, largely because of his 0.81 ERA. But it's been 25 seasons since a relief pitcher has won the Cy Young, and Treinen is only third among closers in saves with 37. As big a stat as ERA is, it's hard to win it on just that. Besides, if writers are going to quibble about Snell's innings pitched, it's hard to vote for a guy who has thrown 100 fewer innings than Snell. How about Corey Kluber? Kluber, a two-time winner of the Cy Young, for the Indians. leads Snell in innings pitched, but not much else. His ERA is a full run higher, and he's won fewer games. Snell has even passed him in strikeouts. Craig Kimbrell? No. The Red Sox closer has thrown just 61 innings and like Treinen, history is against him. Chris Sale? The Boston ace has won only 12 times, and his ERA is higher. The only argument Sale has are his strikeouts, but otherwise, he doesn't have much of claim. Justin Verlander? Again, he has five fewer wins and a higher ERA. His strikeouts are eye-popping with 269. But the Cy Young award isn't about a single statistic. Who else? Edwin Diaz? Gerrit Cole? Luis Severino. None of them have been in Snell's neighborhood. If you vote against Snell, you're holding the trend against the total number of innings against him. "I certainly don’t think that’s a deal-breaker," Rays' manager Kevin Cash said. "I think he’s pretty much cementing his case that he belongs not just in the conversation but at the top of the list. He’s been dominant for a couple of months. He’s at the mercy of me pulling him out of games, so blame me if the 200-inning mark is that big of a deal." Look, eating innings is an important statistic. But it's not the most important -- otherwise, relievers would never be considered. Try ERA (Snell leads). Try opponents' average (Snell leads). Try Whip (Snell is second). In other words, if you gather all of the candidates into the room, and you look for the slam-dunk candidate, it's Snell. Snell's ERA is the lowest by any AL pitcher since Pedro Martinez in 2000. In winning his most recent game, Snell's ninth straight, Snell threw a lot of off-speed pitches to battle the Jays' lineup. "Maybe he didn't think he had his fastball command or didn’t feel that good with the fastball," Cash said. "He was able to locate a lot of off-speed pitches. His off-speed pitches looked really nasty from a lot the swing they (the Blue Jays) were taking. He made a lot of big pitches with two strikes. He was pretty dominant again." After the game, Snell continued to repeat his mantra that he'd wait until after the season to reflect. For now, he's worried about his next start. "I haven’t seen one difference in him whatsoever," Cash said. "I don’t know if Blake would recognize he was going for 20 wins unless we talked about it. He hasn’t changed his mentality, his approach or his focus." The top two winning seasons in Rays' history had belonged to David Price with 19 wins in 2010 and 20 in 2012. Snell has surpassed both seasons. "The hardest thing to do is to stay consistent on a high level in the big leagues against great competition," Snell said. "This division is very tough." He hasn't made it look that way. Of his 30 starts, he's held the opponents to one run or fewer 20 times. The last 10 pitchers to lead the AL in both ERA and victories (outright or shared) have won the AL Cy Young Award. Since 1967, when a Cy Young award was given to each league, 13 of the 14 pitchers who have led the AL in both ERA and wins have won the Cy Young. The only exception is Baltimore's Mike Boddicker in 1984, who lost to Detroit reliever Willie Hernandez. 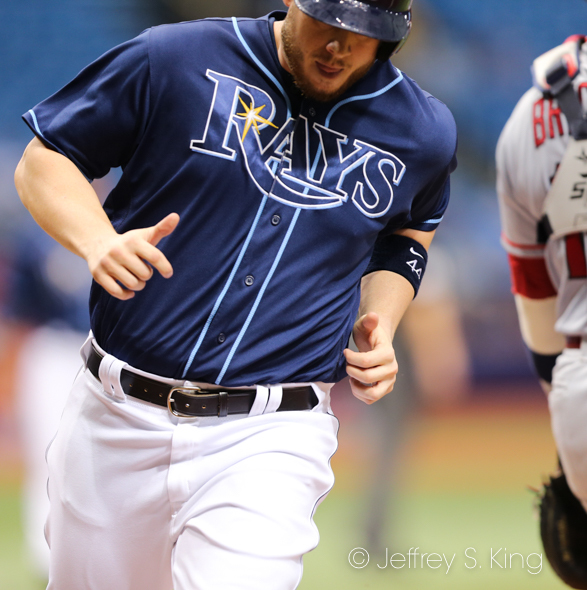 Snell left Sunday's game with a 2-0 lead, and the Rays immediately added three more on a solo homer by C.J. Cron and a two-run shot by Brandon Lowe. The Jays scored twice in the eighth, but Sergio Romo had his 23rd save to close it out. The Rays are now 87-68 and come home for their final seven games of the season. They start a four-game series against the Yankees tonight at 7:05 p.m. Diego Castillo pitches for Tampa Bay. The Yankees have not announced their pitcher. If Snell doesn’t win the award there really is a bias against the Rays and how they do things. Snell is deserving but at the same time the way he has been managed will be a detriment to him winning the Cy Young. Cash pulls him early and often. We will never know if he would be able to navigate through the late innings because he doesn’t get to pitch late into the game. The Rays do that to keep his arm fresh during the long season but it could hurt him in the eyes of some voters who would like to see the Cy Young winner to be a workhorse. Snell is not that. Like all Rays pitchers, for better or worse, he is carefully managed. Verlander will probably be the biggest threat because he has the rep, more innings and strikeouts plus he pitches for a big market, top team. My vote, if I had one, would go to Snell. I agree that Snell should win it. I don’t even think it should be close. My alternate choice, if I had to make one, would be Kluber because of the innings and strikeouts. To me, the voters could think three things and go against Snell. 1. The innings; 2. The past history (I know it’s a one-year award) and 3. the team’s success. I think Treinen would have an argument, too, but as a reliever, he hasn’t worked a great body of innings, either. Hell, he has 14 more saves than Romo. Atleast you and I agree.